A packed house at Galway Lawn Tennis Club's court one were treated to a fantastic display of athleticism, deception and great shot making from both players. It looked like Jens Schoor was in a great deal of trouble after the first game, Youssef Soliman was on fire. He ran down everything the German threw at him with returned interest and was playing some serious squash to accompany his retrieval skills. Jens regruped in the second game, using all of his tactical awareness, as he did all week, picking off Youssef and finding some brilliantly measured back hand drops and leaping to take high forehand volleys early. Youssef ran away with the third and looked to be in command in the fourth, leading 10-6.. the game was far from over as Jens pegged back point after point, lots of lets, lots of intense moments. After an hour's play Youssef finally found a winning shot to close out the game, 11-9 and the match 3-1. A fourth PSA title for the young and supremely talented Egyptian. That rounded up a wonderfully positive week of squash in Galway, hopefully see many of these players back again next year!! Jens Schoor ended the run of qualifier Daniel Mekbib. Superb tactics from the German. Daniel has been on form all week, slotting his forehand winners at 150mph. He didn't get much of a chance today, great display with some wonderful rallies! Off the court in under an hour, that'll be a bonus for Jens in the final. The all-Egyptian match between Youssef Soliman and Mazen Gamal provided unbelievable squash. This match had everything, top drawer shotmaking, power, speed, you name it..
Shame there had to be a winner, but Soliman it was, in five. A match played in a very fair manner also, great to see with such high stakes.. A real treat for the crowd! 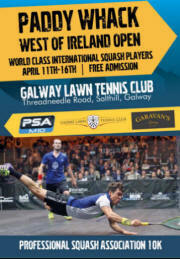 What a night of squash at Galway Lawn Tennis Club! Packed house, great atmosphere and amazing matches!! Top seed Josh Masters was toppled in a big 5 setter by Jens Schoor, nip and tuck for the first three games, not much to seperate them.. Josh ran away with the 4th, 11-4. Tight in the 5th, Jens frustrating Josh, preventing him from playing his winners.. Jens takes it 11-9, 8-11, 11-8, 4-11, 11-5. Next up, qualifier Daniel Mekbib played Shehab Essam. An unbelievable match that had everything. Ferocious pace, deft touches, crowd on the edge of their seats.. Played in the best of spirits, setting great example for all juniors watching to learn from! Daniel upset the seedings, winning 4-11, 11-5, 4-11, 11-6, 12-10. A real treat to watch. Youssef Soliman didn't waste any time in taking out Geoffrey Demont, 3-0.. 11-1, 11-3, 11-1. Impressive performance by Youssef!! Local favourite and last Irishman standing, Brian Byrne took on Mezan Gamal.. Packed to rafters, intense squash! Powerful, persistent and accurate from the Egyptian.. Speedy, skillful and gutsy from the Irishman.. Again, a treat for the crowd. Unfortunately, after a massive effort from Brain, Mazen Gamal takes it 11-7, 11-9, 11-8. Busy night of squash at Galway Lawn Tennis Club! Eight first round matches split between two courts. Irish interest came in the form of Sean Conroy and Brian Byrne.. Exciting match ups all around. Geoffery Demont took on Addeen Idrakie in a match of contrasting styles. Great speed and balance from Addeen, clinical short game from Geoffery. Had it went to 5, it could have spelt trouble for the frenchman.. 3-1 Geoffery, 55 minutes 11-8, 8-11, 11-7, 11-6. 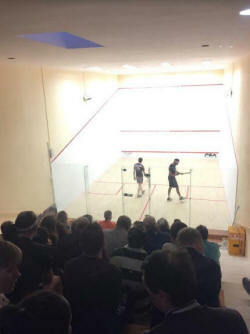 Youssef Soliman beat Ammar Altamimi 3-1, tough squash, great effort from Ammar considering his bags never arrived and he was playing with borrowed shoes and racket.. 15-13, 11-13, 11-5, 11-8. Daniel Mekbib took out the much higher ranked Tom Ford in a 45min powerful display. Very impressive, very clinical. 11-3, 11-9, 11-8. Sean Conroy had a complete disaster against Mezan Gamal, leading 1-0 in games, he stretched and badly injured his leg. Fingers crossed it's a quick recovery for Sean!!! Mezan through 8-11, 11-5.. ret..
Josh Masters and Rory Stewart had a spectacular shootout, not a huge amount of rallying, dozens of nicks, great entertainment. Great match. Josh taking it in 3.. 11-6, 9-11, 11-9, 11-6. Crowd favourite Brian Byrne had a big win, beating Mohd Syafiq Kamal 3-0. 11-7, 11-6, 11-9. Tight squash, straight lines proving the best tactic with quick counter attacks. Great to have an Irishman in 1/4s! Our last match was again a in 4, Jens Schoor beating Ben Grindrod 8-11, 11-6, 11-7, 11-3.